A novel method of yeast immobilization, called “biocapsules”, has been developed in which cells of the yeast Saccharomyces cerevisiae become attached to the hyphae of the fungus Penicillium chrysogenum, remaining adhered following loss of viability of this fungus. Yeast immobilization facilitates higher cell densities than traditional fermentation methods, improves yield, and allows the reuse of the biocatalyst. Yeast cells may adhere to each other via specific cell-surface molecular interactions (flocculation) or may attach to surfaces (biofilm formation), and the roles of these two distinct attachment mechanisms in biocapsule formation is unknown. To elucidate the influence of biofilm formation versus flocculation on the yeast-fungus coimmobilization, a screening of selected strains from the Viticulture and Enology Department collection at the University of California, Davis, was carried out, and their ability to flocculate and form biofilm was quantified. Eighteen yeast strains capable of flocculation and biofilm formation were identified in this screening. Strains displaying differential capabilities in flocculation or biofilm formation and two control strains were further evaluated for their ability to specifically immobilize with P. chrysogenum. Seven strains exhibiting different patterns of flocculation and biofilm formation were identified. Biofilm-forming yeast strains displayed higher rates of immobilization with P. chrysogenum and formed more consistent biocapsules. In contrast, strains able to flocculate developed smaller, inconsistent biocapsules. Although the size and number of biocapsules formed varied by yeast strain, the total mass of biocapsules generated was similar for all strains. These results shed light on parameters that influence yeast-fungus coimmobilization, which may lead to an improvement of biocapsule consistency and advance the field of application for this new immobilization system. The use of immobilized microbial systems in the production of fermented beverages offers many advantages over conventional free cell fermentations. These advantages include high yeast cell densities, product yield improvement, lowered risk for microbial contamination, and reuse of the biocatalyst (Kourkoutas et al. 2004). Various support systems have been used for cell immobilization, including inorganic or organic polymers, natural matrices, and membrane systems (Kourkoutas et al. 2010, Nedović et al. 2010). Natural support systems derive from materials that are generally of food grade with minimal or no pretreatment intervention, such as components of fruit, wood, or sawdust (Kourkoutas et al. 2004). Immobilization supports and techniques have been applied to both alcoholic beverage and fuel ethanol production. A novel yeast-immobilization system, termed “biocapsules,” is based on a natural support matrix consisting of the hyphae of a filamentous fungus Penicillium chrysogenum. The hyphae of this fungus serve as a platform for yeast cell attachment and adherence (Peinado et al. 2004). Biocapsules are hollow, spherical bodies that constitute a natural matrix system that eliminates the cost of inert supports, since it takes advantage of the natural adhesion properties of yeast and filamentous fungus cell walls and minimizes changes to the yeast metabolism and/or yeast viability. Additionally, biocapsules enable diffusion of nutrients and end products to and from the biocapsules due to the porous structure of the filamentous fungus (Peinado et al. 2004, García-Martínez et al. 2011). The rapid diffusion of carbon dioxide is an important feature, as it prevents bubbles from building up within, and breaking, the matrix, which has been an issue with other types of support systems. When the yeast and fungus are cocultivated in a medium supporting hyphal growth under agitation, visible ball structures form. The yeasts then stably attach to the hyphae within the ball structures. Subsequent incubation of the biocapsules in media supporting yeast fermentation enables yeast growth and metabolism, thereby causing the fungus to die, most likely from the combination of ethanol and lack of oxygen, and the hyphal structures remain as a mere support for the attached yeast cells (Peinado et al. 2006). Given their size, biocapsules can be easily recovered from fermentation, and the yeast retains viability and fermentative capacity over multiple rounds of reuse (Peinado et al. 2004). Because of these features, biocapsules have been considered a promising technique for industrial-scale fermentation purposes and have already been utilized in production of white wine, sparkling wine, and natural sweet wine, as well as for bioethanol production from starch and molasses (Peinado et al. 2005, 2006, García-Martínez et al. 2012, Puig-Pujol et al. 2013, García-Martínez et al. 2015). Peinado et al. (2004) observed that when coinoculated with the fungus, flor yeast strains form biocapsules with relatively high consistency and mechanical resistance, defined by the biocapsule’s ability to withstand compression forces. Flor yeasts differ from other yeast in their capacity to autoimmobilize biofilm aggregates forming at liquid-air interfaces under certain conditions (Esteve-Zarzoso et al. 2001, Aranda et al. 2002, Alexandre 2013). Flor yeasts are used for the elaboration of sherry wines because of their ability to survive in a postfermentation environment in which fermentable carbon sources are nearly exhausted, and only ethanol and glycerol remain (Esteve-Zarzoso et al. 2001). Oxygen is required to metabolize these carbon resources. The biofilm-formation process allows the flor yeasts to access regions where oxygen is rich, such as the wine-air interface. Zara et al. (2009) demonstrated the existence of an extracellular matrix among flor yeast forming the velum. The composition of the velum is unknown. The interactions of flor yeast with the fungal hyphal matrix within a biocapsule has been investigated using transmission electron microscopy (García-Martínez et al. 2011). Yeasts were observed to be directly attached to the cell surface of the fungus, and the integrity of the biocapsules was retained after fermentations (Peinado et al. 2006), enabling reuse of the capsules. García-Martínez et al. (2011) established that biocapsules formed naturally, stabilized yeast fermentative activity and viability, and, even after loss of viability of the fungus, retained integrity because of the nature of the cell-hypha contact. The yeasts could adapt to high ethanol conditions and complete the fermentations. However, previous studies were largely conducted with only one strain of flor yeast, which may produce a spectrum of aroma compounds not normally found in table wine yeast (Peinado et al. 2005, 2006, García-Martínez et al. 2015). The main goal of this work was to study the properties of yeast strains that affect coadhesion with P. chrysogenum when forming biocapsules. Although the effectiveness of biocapsule immobilization made with non-flor yeast versus flor yeast has been compared (García-Martínez et al. 2012), specific yeast properties such as flocculation and biofilm-forming abilities, and their effects on the formation of coadhesion, have not been systematically investigated. In this work, we defined methods for assessing flocculation and biofilm-forming ability of yeast strains, and assessed the impact of these properties on biocapsule formation. Known flocculent and biofilm-forming yeast strains were initially screened to observe and quantify flocculation and biofilm-formation phenotypes, and strains displaying differences in these phenotypes were selected for further analysis. The ability of these yeasts to form biocapsules was assessed, and biocapsule parameters such as percentage of immobilized yeasts, number of biocapsules, total volume, diameter, consistency, and dry weight, were evaluated. Saccharomyces cerevisiae yeast strains from the Department of Microbiology (University of Córdoba, Spain [UCO]) and the Department of Viticulture and Enology (University of California, Davis [UCD]) collections were used in this work (Table 1). The S. cerevisiae strains G1 and UCD932 were used as positive and negative controls for both flocculation and biofilm formation, respectively. Eighteen strains were chosen from the UCD collection because of their reported ability to form flocs and/or biofilms. This strain set included S. cerevisiae yeasts isolated from sherry, sparkling, dry, and standard wines, beer, and must, as well as commercial strains (Table 1). After analyzing and quantifying strain-flocculation and biofilm-formation phenotypes, we selected seven strains exhibiting different flocculation or biofilm-formation patterns, together with the G1 and UCD932, for coimmobilization experiments with the filamentous fungus and biocapsule formation. Cell population sizes for strains forming flocs in liquid media are difficult to quantify under the microscope or spectrophotometrically, producing false values. Therefore, the yeasts were pregrown on solid media, YPD-agar (1% yeast extract, 2% peptone, 2% glucose, and 2% agar), and the colonies were transferred to an Eppendorf tube containing the liquid growth medium and agitated for 5 min to avoid flocs and generate the inocula. Yeast and fungus strains used in this study. Yeasts were coimmobilized with the filamentous fungus strain P. chrysogenum H3 from the UCO collection. The fungus was pregrown on a sporulation medium containing 1.7% corn meal agar, 0.1% yeast extract, 0.2% glucose, and 2% agar for seven days at 28°C. To assess flocculation ability, 5 mL of synthetic grape juice medium “minimal must medium” (MMM) was inoculated to a final concentration of 4 × 106 yeast cells/mL (Giudici and Kunkee 1994, Spiropoulos et al. 2000). This synthetic grape juice medium has the following composition (all percentages are w/v): 11% d-fructose, 10% d-glucose, 0.3% l(−)malic acid, 0.3% citric acid, 0.17% YNB (Difco Yeast Nitrogen Base) without amino acids and ammonium sulfate, 10 mg/L ergosterol, and 1 mg/L Tween 80; the nitrogen equivalents were 123 mg/L. The media pH was adjusted to 3.5 with KOH or NaOH. The cells were then incubated at 25°C under agitation conditions, on a rotary drum for five days. For the semiquantitative analysis, pictures were taken at day 5 after the inoculum, both macroscopically and microscopically, the latter by using a Celestron microscope. To quantify nonflocculated versus flocculated yeast population sizes, cultures were filtered through a hydrophilic nylon membrane filter with a 30 μm pore size (NY3004700, nylon mesh filter, hydrophilic, 30 μm, 47 mm) that allowed passage of free or suspended cells, but retained flocs of six or more cells on the filter matrix. This strategy was verified by observing samples under the microscope before and after the filtration (no flocs were observed after the filtration). The dry weights of the suspended and the flocculent yeasts were then measured after drying to a constant weight. The filters were dried in an oven at 80°C constant temperature overnight. Nonflocculant control strains showed some adherence to the membrane, and this value was considered background binding of single cells or of cells in aggregates of less than six. Ten mL of flor medium was inoculated to a final concentration of 6 × 107 yeast cells/mL in a glass test tube containing 0.67% YNB without amino acids and 3% ethanol adjusted to pH 3.5, and incubated at 21°C for five days (Ishigami et al. 2004, Govender et al. 2010). Biofilms were defined as layers on solid surfaces or across the air-liquid interface. Pictures were taken macroscopically at day 5 from inoculation. For quantification, dry weights of biofilm-forming yeast and non-biofilm forming yeasts (precipitated and suspended) were measured. Biofilms were carefully extracted with a 5 mL pipette and a spatula when they were completely covering the medium surface at day 5 (Govender et al. 2010), whereas non-biofilm forming yeasts were collected by centrifugation (4500 rpm for 15 min). S. cerevisiae strains were pregrown for three days in YP + 3% glycerol medium (175 rpm, 28°C). YNB medium without amino acids (Difco), containing 5 g/L gluconic acid as a carbon source and buffered to pH 7 with sodium and KH2PO4, was used as a biocapsule-formation medium (BFM). The medium used for the coimmobilization is suitable for yeast to express its flocculation (Miki et al. 1982a, 1982b, Stratford 1992, 1996, Dengis et al. 1995, Kida et al. 1989, Soares et al. 1991, Straver et al. 1993, Soares and Seynaeve 2000, Verstrepen and Klis 2006, Soares 2011) and biofilmformation phenotypes (Esteve-Zarzoso et al. 2001, Aranda et al. 2002, Alexandre 2013, Zara et al. 2010). Three flasks per yeast strain, each containing sterile, autoclaved 150 mL BFM, were inoculated with 4 × 106 yeast cells/mL and 4 × 106 P. chrysogenum spores. The flasks were then shaken at 175 rpm and at 28°C for six days. Under these conditions, spontaneous immobilization occurred, and yeast biocapsules were produced. The immobilization procedure used was the same as that patented by Peinado et al. (2004). The capacity of cells to be immobilized in the coadhesion assay was determined by quantifying the following parameters: number of nonimmobilized yeasts, immobilized yeasts, percent yeast immobilized, number of biocapsules, diameter, total volume, consistency, and dry weight. Yeast biocapsules were separated from the medium and washed with distilled water prior to analysis. Biocapsules were counted in each of the flasks, and the diameter and the volume occupied by all biocapsules were measured. The total volume of biocapsules formed was calculated by submerging all biocapsules in water from each sample (flask) in a 50 mL graduated cylinder and measuring the difference in volume before and after submersion. Biocapsule consistency was quantified with a TA.XT2 texture analyzer, which measures the force required to compress biocapsules to a 2 mm thickness. For counting the immobilized yeast, 10 biocapsules out of the total from each flask were disrupted with salt to separate the yeast cells from the fungal hyphae. Cells were counted and normalized to the total number of biocapsules in each replicate. Biocapsules were broken by placing them into an NaCl solution (100 mM), crushing with a pestle and mortar for 2 min, then transferred to a test tube and vortexed for 20 sec. As a result, a mixture of yeast cells and P. chrysogenum hypha segments was obtained. Successive differential filtrations were carried out to obtain the released yeast cells for quantitation by using (1) a colander to remove large biocapsule fragments, (2) a 180 μm filter (NY8H04700, nylon mesh filter, hydrophobic, 180 μm, 47 mm), and (3) a 30 μm filter (NY3004700, nylon mesh filter, hydrophilic, 30 μm, 47 mm). Yeast population sizes (nonimmobilized and immobilized yeasts) were determined by direct counting using a hemocytometer grid under the microscope at a 40× objective. The remaining biocapsules were used for measuring the dry weight (80°C constant temperature overnight) and to obtain an average dry weight of the biocapsules. Data obtained from the quantified yeast strains and biocapsule parameters were statistically analyzed with the software package Statgraphics Centurion XVI (Manugistics, Inc.). Analysis of variance and the Kruskal-Wallis tests were used to detect parameters that quantified values depending on the yeast strain analyzed. Further, to detect correlations among yeast strain and biocapsule parameters, a multivariate analysis was performed, and a Pearson coefficient and p-value were calculated for each couple of variables (Table 2). The Pearson coefficient ranges from −1 to +1, and measures the linear relation among variables: a value of 1 is total positive linear correlation, 0 is no linear correlation, and −1 is total negative linear correlation. The p-value tested the statistical significance of the estimated correlations. Eighteen yeast strains were selected from the UCD collection to screen for flocculation and/or biofilm-formation potential (Table 1). Yeast were visually categorized for the formation of cell aggregates during constant shaking (Figure 1). Biofilm-formation capacity was evaluated by assessing the formation of a film on the surface of the tube or growing on the side of the tube in nonagitated samples. The negative control, UCD932, as expected did not flocculate nor form a bio-film. Of the remaining 17 strains, five were flocculent to some degree, and 12 could form a visible biofilm, also to varying degrees (Figure 1). On the basis of their different flocculation or biofilm patterns (see phenotypic qualification and physical aspect in Figure 1), seven of the tested yeast strains (UCD77, UCD519, UCD580, UCD804, UCD854, UCD1109, and UCD1162, along with the controls G1 and UCD932) were selected for further analysis in quantification of flocculation or biofilm formation and P. chrysogenum coadhesion assays. G1, the original strain evaluated by Peinado et al. (2004) for biocapsule formation displaying both flocculation and biofilm formation, and UCD932, a nonflocculating strain unable to form a biofilm, were also included as controls in subsequent assays. Results of semiquantitative assays assessing flocculation, biofilm, and biocapsule formation of the yeast strains. The symbols −, +, ++, and +++ indicate the phenotype qualification (with the number of +’s indicating a higher quantification). Biocapsules were only made with those yeast strains exhibiting different flocculation or biofilm-formation patterns. 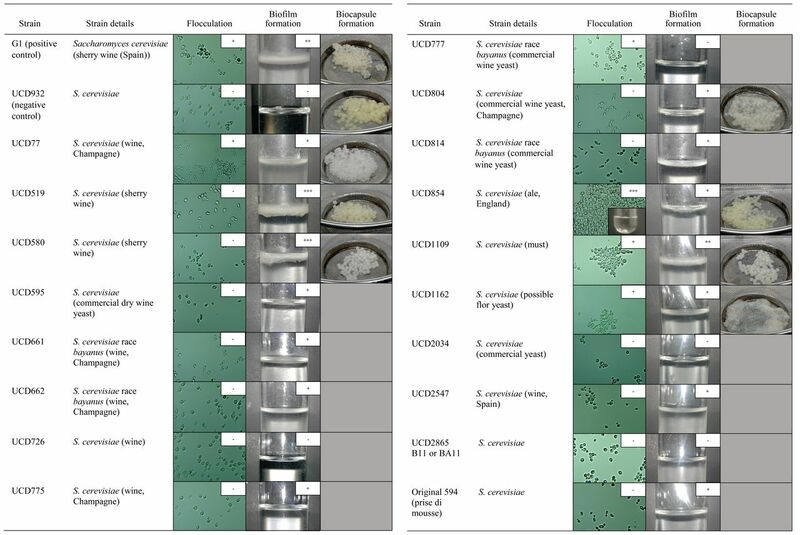 The set of nine strains were evaluated in quantitative assays for assessment of flocculation ability and biofilm-formation capacity (Figure 2). In brief, differential filtration was used to separate free or planktonic cells from adhered cells. The separated populations were then harvested by centrifugation, and the dry weights of the two populations were determined. It should be noted that in the case of nonflocculating strains, a portion of cells was retained on the filter through the filtration process. This weight was considered as a background value. The yeast strain UCD854, originally isolated from British ale beer, displayed the highest flocculation capacity (Figures 1 and 2A), with adhered cells comprising 39.8 of a total dry weight of free and adhered cells of 41.0 mg, or 97%. UCD854 flocs could attain sizes that were macroscopically visible. UCD580 did not form visible flocs in the qualitative assay, but showed a high biomass that was attached to the filter (Figure 2A). UCD580 is a strong biofilm-forming yeast strain, and such strains synthesize proteins such as Flo11p essential for biofilm formation, which may have caused attachment of the cells to the material of the membrane filter used (Fidalgo et al. 2008). Yeast strain flocculation (A) and biofilm formation (B). In A, black bars represent flocculated yeasts and in B, biofilm yeasts. Gray bars represent nonflocculated yeasts and nonbiofilm yeasts in A and B, respectively. The error bars and the value after the ± sign indicate the standard deviation. Different letters above the bars indicate homogeneous groups statistically significantly differing in percentages of flocculation and biofilm formation among the strains (p < 0.05, F-test). UCD580 displayed the highest biofilm-forming capacity among the screened yeast strains (Figure 2B), both in terms of biofilm total dry weight and the biofilm dry weight percentage, reaching up to 7.2 mg of biofilm out of 29.7 mg of total cells (24%). This strain was closely followed by G1 with a 6.5 mg biofilm dry weight out of a total of 31.0 mg (21%), and UCD804 with 5.2 mg out of 25.3 mg (21%). UCD580 and G1 are both flor yeasts used for sherry wine elaboration. Although G1 formed flocs when grown in MMM under agitation, it shows low retained biomass values. It might be that G1 flocs are less adherent than others and that yeast cells were disaggregated during the filtration, thus yielding low retained dry weight values. UCD1109 isolated from must and the sherry wine yeast UCD519 grew better in the flor medium than the other strains, reaching total dry weights of 52.3 and 42.0 mg, respectively. UCD1162 and UCD77 displayed the lowest biofilm percentage values: 0.5 mg out of 10.3 mg (5%) and 1.0 mg out of 18.2 mg (5%), respectively. The selected yeast strains were then evaluated for biocapsule formation and biocapsule properties (Figure 3). 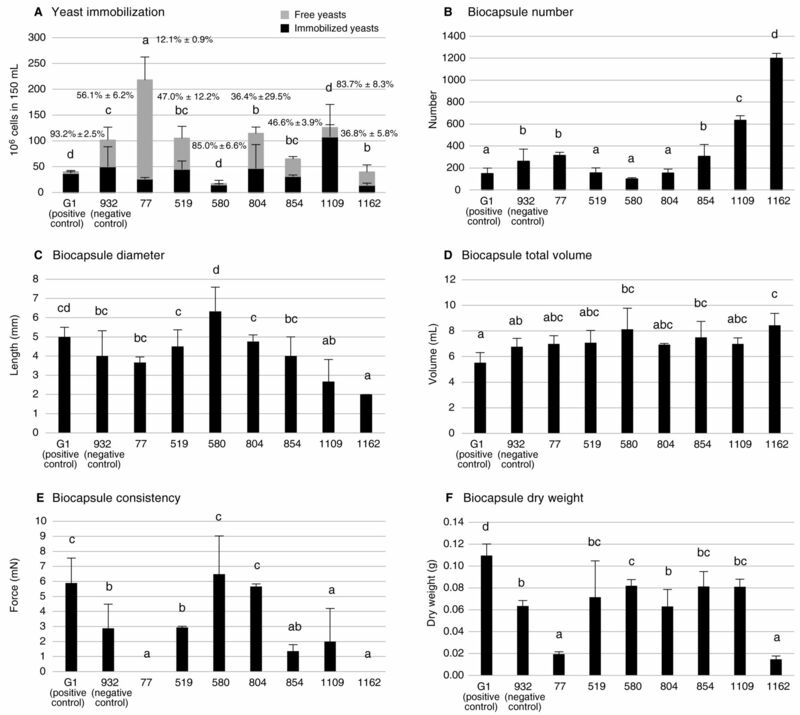 The percentage of immobilized cells of the total population present during biocapsule formation was measured in addition to numbers, diameters, and dry weights of the biocapsules formed. Biocapsule consistency was defined as resistance to compression as measured in the texture analyzer. Using the Kruskal-Wallis test, we found that all parameters, except for “biocapsule total volume,” were dependent on the yeast strain with a p-value < 0.01 (biofilm formation, yeast immobilization, biocapsule number and consistency, and dry weight), and p < 0.05 (flocculation and biocapsule diameter). Biocapsule total volume (Figure 3D) appeared to be dictated by the amount of growth of the fungus, which was uniform across all samples and replicates, whereas other biocapsule parameters were more dependent on yeast strain. Yeast strain biocapsule-related parameters. In A, black bars represent yeasts immobilized in biocapsules. Gray bars represent nonimmobilized or free yeasts. In E, strains with no values, that is, UCD77 and UCD1162, consistently had values below the lower limit of quantification. The error bars and the value after the ± sign indicate the standard deviation. Different letters above the bars indicate homogeneous groups statistically significantly differing in the parameters among the strains (p < 0.05, F-test). The highest immobilization (Figure 3A) capacity was observed for the positive-control G1 flor yeast, with 93.2% of the yeast cells adhering to the filamentous fungus hyphae. Another strain of flor yeast, UCD580, had the second-highest adherence percentage, with 85.0% of the cells being attached to the Penicillium hyphae. Both strains showed high biofilm-forming capacity. G1 total yeast cells in the BFM were more abundant than UCD580, that is, 4.0 × 107 versus 1.7 × 107 total cells in 150 mL, respectively. The highest number of immobilized yeast cells was found with strain UCD1109, reaching 1.1 × 108 cells; however, the percentage of immobilization was lower, at 83.7% (Figure 3A). It should be noted that this strain reached the highest cell population under biofilm formation, but had relatively low biofilm-formation percentages and low total cell mass under the flocculation condition. UCD77, a yeast strain isolated from sparkling wine production, showed the lowest immobilization efficiency (12%), but the highest total population (2.2 × 108 cells in 150 mL BFM) (Figure 3A). Abundant yeasts dispersed in the medium, with only a few cells attaching to the fungal hyphae, may indicate that the yeast strain does not need to attach to the fungus in order to grow in a medium such as BFM. The major carbon source in BFM is gluconic acid, which can be utilized by S. cerevisiae as the only carbon and energy source—which seemed to be the case for UCD77—but many other yeast strains do not grow well on this substrate. It should be noted that UCD77 is a strain with a very low ability to form biofilm, with only 5.41% of the total biomass and flocculation being close to the strain average value (79.3 ± 4.53%). The number of biocapsules formed varied 10-fold, from a low of 100 to >1000, with the average number formed being ~360 (Figure 3B). The highest values were obtained with UCD1162 (1198 biocapsules). This number was significantly above those for all other strains. UCD1162 was characterized mainly by its limited ability to form biofilm (4.85%), and by low average flocculation. UCD1109 also formed nearly twice the average number of biocapsules (632). UCD1162, UCD1109, UCD854, and UCD77 formed more biocapsules and exhibited less ability to form biofilm than the biofilm-forming yeast strains G1, UCD519, UCD580, and UCD804. This observation suggested that yeast biofilm formation inversely correlates with the number of biocapsules formed. Furthermore, yeast strains with the lowest biocapsule diameters (Figure 3C) had the highest number of biocapsules, indicating that there may be a correlation between biocapsule diameter and biocapsule number (Figure 4), and that both may be functions of the biofilm-forming capacity of the cells. Linear regression of the biocapsule diameter and biocapsule number parameters. Biocapsule total volume (Figure 3D) did not differ among the yeast strains as significantly, compared to other parameters. The results of the present study show that strains with higher capacity to form a biofilm produce larger but fewer biocapsules than those made with yeast strains with lower capacity to form a biofilm. The yeast affects the dimensions of the biocapsules in a way that is correlated with its ability to form a biofilm. In addition, the strains with the highest biofilm-forming ability, that is, G1, UCD580, and UCD804, formed biocapsules that resisted deformation in the texture assay, and less resistant biocapsules were obtained by immobilizing the strains with lower biofilm-forming capacity, that is, UCD77, UCD854, UCD1109, and UCD1162. UCD519, which formed a heavy but fragile biofilm (fragments detached from the biofilm were observed with this strain), formed biocapsules with low consistency (similar to that of UCD932) (Figure 3E). This may indicate that in addition to the biofilm weight, other factors (i.e., fragility) also affect the consistency of the biocapsules formed. Similarly, heaviest biocapsules were obtained with the flor yeast G1 yeast strain, while the lightest were formed with the non-biofilm forming UCD77 and UCD1162 (Figure 3F). The other strains did not differ significantly in dry weight, with an average dry weight of 0.07 g.
After applying the Pearson test to detect correlations among yeast strain and biocapsule parameters, the lowest p-values were obtained for the following parameter couples: “biocapsule diameter” - “yeast forming biofilm (%),” “biocapsule consistency” - “biofilm yeast weight,” and “biocapsule consistency” - “yeasts forming biofilm (%)” (Table 2). For all these parameter couples, the Pearson coefficients were >0.7, indicating that a positive correlation existed for each, reaching 0.93 in the case of “biocapsule consistency” and “yeasts forming biofilm (%)”. Larger and more consistent biocapsules were obtained by immobilizing biofilm-forming yeast strains. This result was consistent with the observation by Peinado et al. (2004) who proposed that flor yeasts are better candidates for making biocapsules (in terms of consistency) than those without the ability to form a biofilm. On the other hand, flocculation appeared to be inversely correlated with the biocapsule consistency: “nonfloc yeast weight”-“biocapsule consistency” showed a Pearson value of 0.4274 and a p-value of 0.0262. However, a positive correlation (Pearson coefficient = 0.6849, p = 0.0001) between the number of immobilized yeasts and the amount of yeasts that did not form a biofilm in the flor medium (Table 2) may indicate that a yeast’s ability to form biofilm and the number of yeast cells immobilized in biocapsules are negatively correlated. Biocapsule dry weight (Figure 3F) was positively correlated with both the biofilm yeast weight and the weight of non-biofilm forming yeasts. Not surprisingly, this indicated that biocapsule weight is positively correlated with the total amount of yeast growing under the biofilm-forming conditions. However, it should be considered (1) that the p-value for “biofilm yeast weight” was lower than that for “nonbiofilm yeast weight,” and (2) that the “biocapsule dry weight” was also positively correlated with a p < 0.005 to the percentage of yeasts forming biofilm, meaning that biofilm formation positively affects the weight of the biocapsules. The same was true for the percentage of yeasts immobilized within biocapsules. 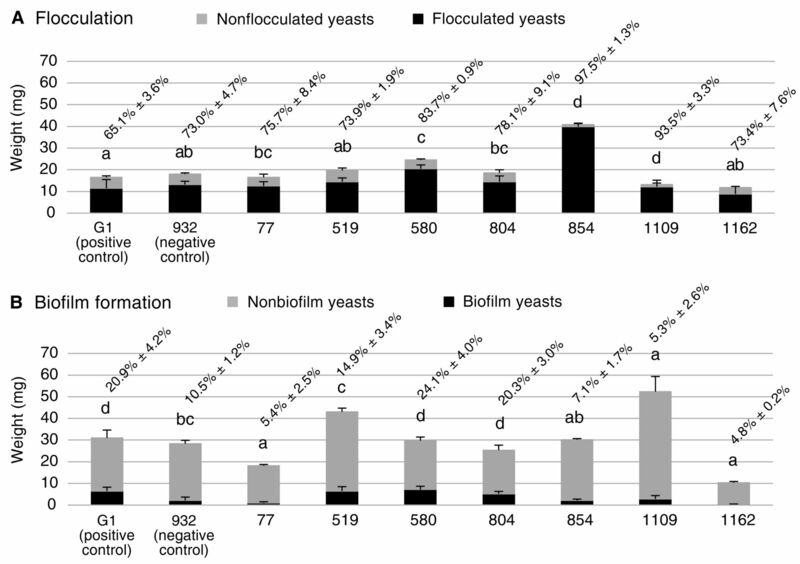 Last, the Pearson test also showed that the number of biocapsules obtained at day 6 of the fungus-yeast coinoculation is negatively correlated with biofilm formation (as previously mentioned), but positively and significantly correlated with the yeast capacity to flocculate under agitation. The flor yeast strain G1 has been shown to form biocapsules that display fermentative capacity and retain yeast cell viability (García-Martínez et al. 2012). This strain both flocculates and forms a velum biofilm during sherry wine production. It is unclear whether any or all of these properties impact the coadhesion to fungal hyphae. To determine the cellular properties that are important in biocapsule formation and functionality, we screened a set of wine and beer yeast strains for flocculation and biofilm phenotypes, and then evaluated a subset for biocapsule formation. It was shown that these yeasts immobilize differently with the filamentous fungus P. chrysogenum. Values from all parameters evaluated differed among the strains with a p < 0.05, except for “total volume of biocapsules”. Biofilm formation is defined as a biological process in which planktonic microorganisms grow at a liquid-air interface, as is the case for flor or velum, or on a solid substrate under the flow of a liquid, as is the case for cells growing on the surface of the hyphae of filamentous fungi (Kuchin et al. 2002, Ishigami et al. 2006, Fidalgo et al. 2008). This means that flor yeast strains capable of biofilm formation can further extend a film on a solid substrate, which can be the hyphal surface of a filamentous fungus. It must also be considered that the matrix formed by the filamentous fungus can trap air during agitation. Accordingly, flor yeast may encounter an environment in the hyphal matrix that is similar to that during biological aging (e.g., during sherry wine elaboration) in which oxygen is necessary to metabolize the carbon source present in the medium. Both conditions promote the onset of biofilm formation in these yeasts. Once the biofilm-forming yeasts are attached to the hyphae, they can form an extracellular matrix, as previously observed in the velum formed by some strains (Zara et al. 2009). This extracellular matrix was later detected in the biocapsule walls by Peinado et al. (2006), who observed this type of connection of yeasts to hyphae. The ability of flor yeasts to form this fibrillary material, which until now is of unknown composition, may encompass the biocapsules and therefore explain the larger size of the biocapsules. Biocapsule dry weight and percentage of yeasts immobilized were both directly correlated with the weight of the yeast biofilm and the weight of the non-biofilm forming yeasts. Nonetheless, they were also positively correlated (with a p < 0.005) with the percentage of yeast forming a biofilm; thus, the formation of the biofilm positively affected the weight of the biocapsules. 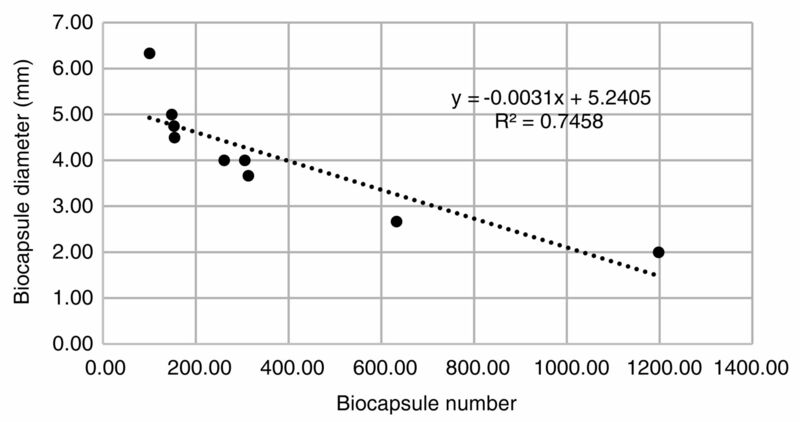 The number and diameter of the biocapsules appeared to be inversely correlated: the more abundant the number of biocapsules, the smaller the biocapsule diameter. Consequently, the total volume remained consistent (Figure 3D). We also observed that the smaller biocapsules in larger quantities were formed with the non-biofilm forming strains, whereas biofilm-forming yeasts developed biocapsules that were larger in diameter, but smaller in quantity (Figure 4). This correlation was further confirmed by a negative significant Pearson coefficient. Unlike biofilm formation, a yeast’s ability to flocculate allowed for a greater number of biocapsules formed, but resulted in a smaller average diameter of each biocapsule. Flocculation and biofilm formation are two different types of cell aggregation. Flocculation is a homotypic process, involving only one type of cell in the interaction (Stratford 1992, Stewart 2009), and all cells have components on their cell surfaces (i.e., lectins and α-mannans) that participate in the adhesion reaction (Miki et al. 1982a). Our data suggested that yeast cell self-adhesion may compete with adhesion to the hyphae of the filamentous fungus (i.e., non-self adhesion), and more yeast cell surface used for adhesion to other yeast cells rather than to the fungus may lead to reduced hyphal growth in the same biocapsule. Thus, small biocapsules resulting from the use of flocculating yeasts should proportionally contain fewer P. chrysogenum hyphae. In contrast, cell-surface changes associated with biofilm formation can enable attachment to a wide array of surfaces and may confine the population to the surface-air interface. The stronger correlation of biofilm-forming capacity with adhesion to the fungus suggests that factors driving cell-cell self-interactions may block interaction with the fungal hyphae. Biocapsule consistency was shown to be yeast strain dependent (Figure 3E). This parameter also strongly relates to the yeasts’ ability to form biofilm, with Pearson coefficients > 0.7 for the correlations between “Biocapsule consistency” -“Biofilm yeast weight” and “Biocapsule consistency” - “Yeast forming biofilm (%)”. Yeast strains with high biofilm weights exhibiting a low biocapsule consistency (such as UCD519) indicated that there may be other factors in addition to biofilm weight that influence the consistency of the biocapsules, such as biofilm fragility. Biocapsule consistency was also inversely correlated with flocculation capacity. A yeast’s competence to form biofilm, allowing it to strongly attach to the fungal hyphae and to produce extracellular polymers that facilitate matrix formation, may explain the strong biocapsule resistance to breaking forces. In contrast, flocculating yeast cells that aggregate with each other and form flocs that can potentially interfere with attachment to the fungus produced less deformable biocapsules. Yeast ability to coadhere with the filamentous fungus P. chrysogenum may be due to multiple factors. The biocapsule matrix can be considered a location where cocultured yeast cells are entrapped and where air is stored in their matrix gaps. This matrix is beneficial for yeast and makes it a suitable environment for oxidatively metabolizing the nonfermentable carbon source and gluconic acid when attached to the hyphae. Further, similar to flocculation, the main purpose of the yeast-hypha association could be a community mechanism for survival: the external cells from the floc structure may directly protect the internal cells against harmful environments by physically shielding them. When exposed to several harmful conditions such as nutrient starvation, ethanol toxicity, cold-shock, and osmotic stress, flocculent yeasts undergo flocculation (Gibson et al. 2007). Thus, biocapsule formation provides protections similar to floc formation and thereby enables long-term survival of a cellular community of yeast cells in an unfavorable environment. Another hypothetical reason is that yeast and fungus establish a symbiotic relationship because the yeast (which catabolizes gluconic acid less easily than the fungus) may obtain gluconic acid subproducts from the fungus that are easier to utilize as a carbon and energy source. Using transmission electron microscopy, Peinado et al. (2006) observed that within the contact zones with hyphae, vesicular structures are located near the contact zone in the cytoplasm of yeast cells, thus providing a polarized aspect to these cells. Cross-feeding may be a strong selective pressure for the communal association of these cells. Even though both S. cerevisiae and P. chrysogenum can utilize gluconic acid as a carbon source and incorporate it into the carbohydrate acid metabolism, S. cerevisiae catabolizes gluconic acid at a later stage. In the case of flor yeasts, it has been observed that gluconic acid at concentrations of <5 g/L is assimilated during the aerobic biological aging process of sherry wines (Cortés et al. 1999), in which consumption is initiated after 18 days (Peinado et al. 2003). This delay may occur because the protein that catalyzes the phosphorylation, the cytoplasmic putative gluconokinase YDR248C, is upregulated in amino acid starvation (Gasch et al. 2000). Conversely, Schmitz et al. (2013) reported that P. chrysogenum has higher uptake rates for gluconate than for glucose. Hence, during biocapsule formation, the first six days after the yeast-fungus coinoculation, YDR248C may not yet be present, and yeasts are forced to establish a symbiotic relationship with the fungus to obtain an alternative carbon source from the fungal gluconic acid degradation. S. cerevisiae immobilization in the filamentous fungus P. chrysogenum and the resultant formation of biocapsules was found to depend on the yeast’s ability to flocculate or aggregate into biofilms. Biofilm-forming yeast strains had higher rates of immobilization and formed larger, more consistent biocapsules, whereas flocculating strains formed more abundant biocapsules that were smaller and less uniform. Understanding the relationship of flocculation and biofilm formation with yeast immobilization on P. chrysogenum is not only important in terms of potential industrial application, but also for our understanding of possible evolutionary mechanisms linked to physical interactions among different organisms in shared ecological niches. The way in which mixed-species communities control their cell-cell interactions in complex habitats may provide novel insights into ecosystem evolution. Such physical associations can increase the probability of metabolic exchange between cells of different species, and may support symbiotic associations as conditioned by the selective pressures in various fermentation environments. The authors thank the Ministry of Innovation and Science (Spain) for an FPU scholarship awarded to Jaime Moreno-García. The Spanish Fulbright commission is also thanked for granting a Predoctoral Research Fulbright Scholarship at the University of California, Davis, to Jaime Moreno-García. This project was cofunded by the XXI Programa Propio de Investigación de la Universidad de Córdoba (Spain).
. 2013. Flor yeasts of Saccharomyces cerevisiae–their ecology, genetics and metabolism. Int J Food Microbiol 167:269–275.
. 2002. Correlation between acetaldehyde and ethanol resistance and expression of HSP genes in yeast strains isolated during the biological aging of sherry wines. Arch Microbiol 177:304–312.
. 1999. Biological aging of sherry wines with high content in gluconic acid. In Proceedings, V National Congress of Enologists. pp. 141–144. Extremadura Enologists Association, Mérida, Spain.
. 1995. Mechanisms of yeast flocculation: Comparison of top- and bottom-fermenting strains. Appl Environ Microbiol 61:718–728.
. 2001. Yeast population dynamics during the fermentation and biological aging of sherry wines. Appl Environ Microbiol 67:2056–2061.
. 2008. Coding repeat instability in the FL011 gene of Saccharomyces yeasts. Yeast 25:879–889.
. 2011. Co-culture of Penicillium chrysogenum and Saccharomyces cerevisiae leading to the immobilization of yeast. J Chem Technol Biot 86:812–817.
. 2012. Potential use of wine yeasts immobilized on Penicillium chrysogenum for ethanol production. J Chem Technol Biot 87:351–359.
. 2015. Natural sweet wine production by repeated use of yeast cells immobilized on Penicillium chrysogenum. LWT Food Sci Technol 61:503–509.
. 2000. Genomic expression programs in the response of yeast cells to environmental changes. Mol Biol Cell 11:4241–4257.
. 2007. Yeast responses to stresses associated with industrial brewery handling. FEMS Microbiol Rev 31:535–569.
. 1994. The effect of nitrogen deficiency and sulfur-containing amino acids on the reduction of sulfate to hydrogen sulfide by wine yeasts. Am J Enol Vitic 45:107–112.
. 2010. FLO gene-dependent phenotypes in industrial wine yeast strains. Appl Microbiol Biotechnol 86:931–945.
. 2004. FL011 is essential for flor formation caused by the C-terminal deletion of NRG1 in Saccharomyces cerevisiae. FEMS Microbiol Lett 237:425–430.
. 2006. FL011 is the primary factor in flor formation caused by cell surface hydrophobicity in wild-type flor yeast. Biosci Biotechnol Biochem 70:660–666.
. 1989. The effect of aeration on stability of continuous ethanol fermentation by a flocculating yeast. J Ferment Bioeng 68:107–111.
. 2004. Immobilization technologies and support materials suitable in alcohol beverages production: a review. Food Microbiol 21:377–397.
. 2010. Immobilization of microbial cells for alcoholic and malolactic fermentation of wine and cider. In Encapsulation Technologies for Active Food Ingredients and Food Processing. Nedović VA and Zuidam NJ (eds. ), pp. 327–343. Springer, New York, NY.
. 2002. Snf1 protein kinase and the repressors Nrg1 and Nrg2 regulate FL011, haploid invasive growth, and diploid pseudohyphal differentiation. Mol Cell Biol 22:3994–4000.
. 1982a. Possible mechanism for flocculation interactions governed by gene FL01 in Saccharomyces cerevisiae. J Bacteriol 150:878–889.
. 1982b. Repression and induction of flocculation interactions in Saccharomyces cerevisiae. J Bacteriol 150:890–899.
. 2010. State of the art in immobilized/encapsulated cell technology in fermentation processes. In Food Engineering Interfaces. Food Engineering Series. Aguilera J, et al. (eds), pp. 119–146. Springer, New York, NY.
. 2003. Effect of gluconic acid consumption during simulation of biological aging of sherry wines by a flor yeast strain on the final volatile compounds. J Agric Food Chem 51:6198–6203.
. 2004. Method of obtaining yeast biocapsules, biocapsules thus obtained and applications of same. World Intellectual Property Organization. WO2004029240 A1.
. 2005. Use of a novel immobilization yeast system for winemaking. Biotechnol Lett 27:1421–1424.
. 2006. Yeast biocapsules: A new immobilization method and their applications. Enzyme Microb Tech 40:79–84.
. 2013. Application of a new organic yeast immobilization method for sparkling wine production. Am J Enol Vitic 64:386–394.
. 2013. Simultaneous utilization of glucose and gluconate in Penicillium chrysogenum during overflow metabolism. Biotechnol Bioeng 110:3235–3243.
. 2011. Flocculation in Saccharomyces cerevisiae: A review. J Appl Microbiol 110:1–18.
. 2000. Induction of flocculation of brewer’s yeast strains of Saccharomyces cerevisiae by changing the calcium concentration and pH of culture medium. Biotechnol Lett 22:1827–1832.
. 1991. Influence of aeration and glucose concentration in the flocculation of Saccharomyces cerevisiae. Biotechnol Lett 13:207–212.
. 2000. Characterization of hydrogen sulfide formation in commercial and natural wine isolates of Saccharomyces. Am J Enol Vitic 51:233–248.
. 2009. The Horace Brown medal lecture: Forty years of brewing research. J I Brewing 115:3–29.
. 1992. Yeast flocculation: A new perspective. Adv Microb Physiol 33:2–71.
. 1996. Induction of flocculation in brewing yeasts by change in pH value. FEMS Microbiol Lett 136:13–18.
. 1993. Determinants of flocculence of brewer’s yeast during fermentation in wort. Yeast 9:527–532.
. 2009. FL011 gene length and transcriptional level affect biofilm-forming ability of wild flor strains of Saccharomyces cerevisiae. Microbiology 155:3838–3846.
. 2010. Ethanol-independent biofilm formation by a flor wine yeast strain of Saccharomyces cerevisiae. Appl Environ Microbiol 76:4089–4091.